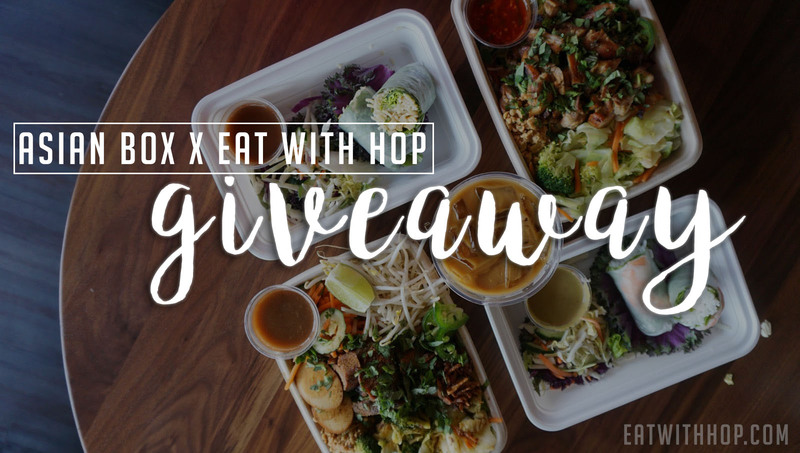 Giveaway | Asian Box - The Fresh And All-Natural Authentic Farm to Box Vietnamese Food - EAT WITH HOP! Asian Box just recently opened near University of California, Irvine! It's the perfect place to grab a quick, filling and healthy meal! This is what the outside of the Asian Box restaurant looks like! It is in the same plaza as Stricklands and Chase Bank and The Habit. Once you enter, you'll be welcomed by friendly faces and smiles! "Welcome to the box," they'll say! Ordering is easy peasy! You can either order with the staff in line or just grab their ordering sheet! Kevin and I found it more relaxing to just grab a seat first and pencil in our order by filling out the ordering sheet! That way, we could carefully think what to get so we wouldn't end up getting the same thing. Planning meals is important so we can maximize the fullest potential out of trying different dishes! Going here and being near UCI was sorta nostalgic for me. I used to be an Anteater and attended UCI many many moons ago.. and filling out this ordering sheet I kinda felt like taking a test. LOL Or filling out paperwork. BUT IT'S FOOD SO IT WAS FUN. To start, we got spring rolls! There were 2 options: shrimp spring roll and tofu spring roll! Had to get Vietnamese Coffee to try it out here. It is pretty good but not too particularly strong. The taste was enjoyable and sweet! We also got another drink called the lemon-lime marmalade. NOW THIS IS TO DIE FOR! Seriously! The marmalade is made fresh every single day and gives the drink a rich citrus-y and zesty flavor. It's basically a lemonade with jam (marmalade) and which adds a bit of sweetness to the drink. SO YUM! Get multiple orders of this because you'll be addicted! This is coconut curry that they serve as a sauce. It was seriously so good and rich in coconut flavor. There's a bit of spicy kick to it but overall it works great as a dip/sauce! I wanted to take it home too to eat with some bread... because this is also savor-worthy! So underneath all this goodness is the chilled vermicelli rice noodles! Meet ROLL-VERINE a.k.a. Kevin with some delicious spring rolls as weapons. He's holding tofu spring rolls on the left and shrimp spring rolls on the right! I love how their paper straws are very thick so it's stiff and strong and it is decorated with the Asian Box logo with rickshaws! Feeling so Viet here. Sort of. They have a welcome sign in Vietnamese too~ which literally translates to welcome valuable guests! I love how there is plentiful outdoor seating with heaters! We went on a windy day and it felt nice to stay by these heaters outside! Asian Box is that fast-casual restaurant that needs more recognition. At first, just hearing the name, you wouldn't really know what the restaurant specializes in. But upon entering, you'll see a welcome sign in Vietnamese saying, "Chào Mừng Quý Khách" and then be happily greeted be all the wonderful employees inside, "Welcome to the Box." The box, the Asian Box to be exact, specializes in Vietnamese food. This is a first for me. I have never heard of a sorta "Chipotle" style Vietnamese restaurant ever but Asian Box has been around for quite a few years now originating from North California. Irvine is their very first ever Orange County location and is a prime location for UCI students to grab a quick and affordable meal. ...quality, fast-casual Vietnamese food with more convenience and cleanliness. This isn't typical of restaurants in Little Saigon. Let's be honest, many Vietnamese restaurants in the Westminster / Garden Grove area aren't always the cleanest and service isn't always the best. But you can bet the food is mostly authentic. At Asian Box, miles away from the Vietnamese hub of Little Saigon, this restaurant still manages to deliver quality, fast-casual Vietnamese food with more convenience and cleanliness. They are expanding and spreading their philosophy of healthy, transparency and sustainability all over Southern California with locations in Los Angeles and more. Read about their story here. So it's time to talk about what Kevin and I ordered! How does the taste measure up?! Shrimp: ours had 2 big juicy shrimps in each roll! Tofu: Personally didn't try this but my mom said it was good! Vietnamese Coffee ($2.75) - not as strong as Lee's Coffee or other places but is a solid drink! Not overly sweet or anything either. Great portions! There was soo much chicken and overall a huge portion of food for just around $13 for great quality food with organic ingredients. Kevin couldn't even finish the entire box because there was so much food packed in one box! So I think this would be great so share or to be eaten as 2 meals! Chicken was aplenty and flavorful with the 6-spices blended in. Also soft and tender! We got to try other sauces even though we only ordered Hot Box for this. The Curry Sauce is a coconut curry that you can dip the meat with. A-MAZING! All the veggies tasted very fresh and overall this dish made us feel clean. Worth it for the price since the portions are big. Even though I didn't order double meat, my box still came with plenty of pork and even I was getting full and had leftovers. The Asian Street Dust reminded me of that ... sorta like a cajun rub or even the bomb dust from Belly Bombz. Since it's dry it needed a wet sauce too but luckily they gave us some other sauces on the side! I love the tamarind sauce and the coconut curry sauce! I recommend you try the sauces too so you can find out what you like! The chilled rice noodles are basically bún. This meal basically like a fast-casual version of Bún thịt nướng except the pork is more like thicker cuts and in strips. The entirety of the meal was very fresh and clean tasting which is how Vietnamese food usually is. Always with plenty of veggies pickled veggies and lots and lots of herbs! *Everything is gluten-free and there are vegan-friendly options! Even if I am not craving Asian Box (Vietnamese food) since I usually eat Vietnamese food at home a lot.... I would totally go to Asian Box to get their signature drink: Lemon-Lime Marmalade! It is amazing and super refreshing and the lemoande isn't sticky or artificial tasting like other places. The marmalade is thick and zesty and adds a bit of sweetness to the lemoande. Overall, I RECOMMEND GETTING THE LEMON-LIME MARMALADE! + They let you sample the meat before you order it so there won't be any disappointed surprises later! + They also have staff walking around the store giving out samples like their drinks! + Overall vibe here is very positive and friendly! GIVEAWAY TIME! WIN A FREE MEAL TO ASIAN BOX! Win one (1) free box at Asian Box of your choice. Have you ever heard of Asian Box before reading this post? What kind of box sounds the most delicious to you? There are so many options like chicken with chilled noodles? Pork with Jasmine rice? Coconut Curry Sauce all over? Let me know below! 2. (Optional) Visit the Asian Box Facebook! Like what you see? Give them a "like"! 3. (Optional) Visit the Asian Box Instagram and give them a follow! All entries must satisfy all of the requirements or will otherwise be disqualified. By entering, participants agree to be subscribed to the Eat With Hop! newsletter to receive updates on new posts (can unsubscribe anytime). Participants must be able to provide a valid mailing address so I can send you the prize! Open to anyone with an Asian Box location nearby! They have locations in Orange County, Los Angeles, and the Bay Area in Northern California. Contest ends March 31, 2017. Two lucky taste buds will be chosen and emailed the first week of April so check your spam box!